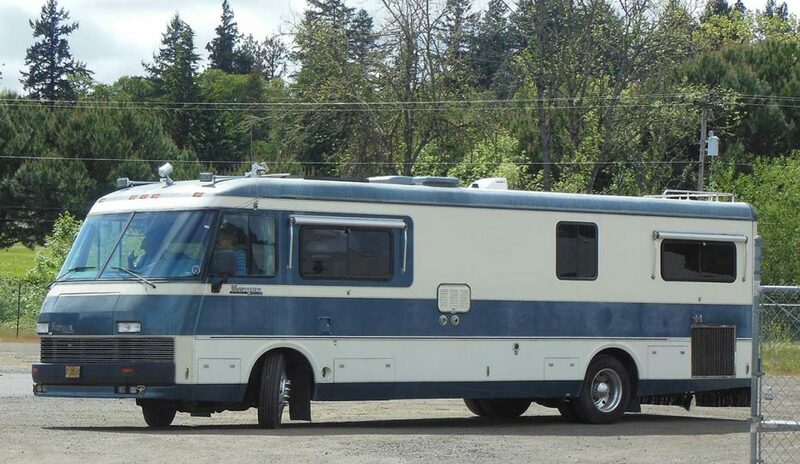 Last month, Jere and I announced to family our intention to get an RV and “run away from home,” living and working on the road as we travel around the US seeing the sights and visiting friends and family. Yesterday it became a lot more REAL. I actually drove our new (to us) RV and it wasn’t nearly hard as I thought it would be. Okay, I admit, I did nearly take out part of our fence on the narrow section of our driveway. It still has the original tile (real tile!) counter tops and kitchen floor, and oak cabinets throughout. Being nearly 30 years old, it needs some TLC and upgrades on the inside, but all of the engine and “house” systems seem to work fine. We’ve been playing with it today, seeing how everything works. Lots to learn! We plan to do some remodeling in order to get a good desk and work space for each of us. New carpets and window treatments are probably also on the horizon, but we haven’t made any final decisions on what we want. I’ll post pictures as we go through the process. Our goal now is to do a few smaller trips (like to my sister’s 80th birthday party this summer) and then hit the road for real in September (or so) heading generally south and then east, to end up in Florida to spend time with Jere’s family and then go to the Handcrafted Soap and Cosmetic Guild 2016 Conference in Tampa, Florida in May. After that, we’ll probably head back west through the northern states. We have lots of friends to visit on the way, and many places we’ve always wanted to visit pinned on the map. I’m also considering the idea of doing some consulting (label reviews and such) and/or offering some classes as we make our way east across the southern states if there’s any interest. There are so many things to do to get ready. September seemed like a long time away, but when I look at what has to get done … sheesh! If nothing else, it will get me to finally face all the “stuff” I’ve been accumulating over the years. Thank heavens for my new ScanSnap scanner – at least I know what to do with all the PAPER!